Microsoft has a flair for annoying its users with default apps, pre-defined settings and even pinned icons. And one can only pray that the tech giant will learn from all the How-to removal or changing tutorials regarding their products and stop adding settings that prove to be a nuisance for its users. But clearly, they have not. Microsoft Edge is not everyone’s favorite web browser especially due to its predecessor’s infamous reputation which is one of the reasons why people are not comfortable with Windows 10’s pre-installed browser. Some web browsers have a built-in prompt that asks about default browser on their launch so we won’t be discussing that scenario. 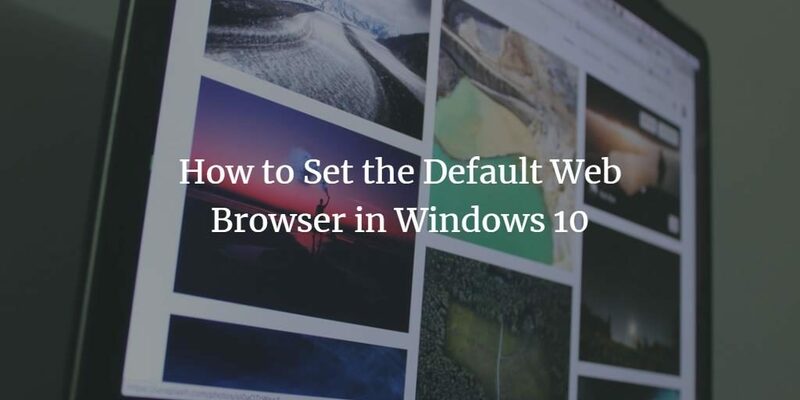 Instead, we will list down the famous browsers and their default setting configuration step by step for users with Windows 10 computers. Open Chrome browser by double-clicking on its icon. Once the browser opens, click on the ‘Customize and Control Chrome’ button present on the top right corner. From the opened menu, select ‘Settings’. A new tab will open with settings label. Go to ‘Default Browser’ section and select on ‘Make Google Chrome the Default Browser’ button and close the window. Click on the menu and click on ‘Options’ from the pop-out list. A Firefox’s Options window will appear in front of the browser. Choose the ‘General’ tab listed in the left pane. In the right pane of General, go to the first section ‘Startup’ and click on the ‘Make Default’ button. Click ‘Ok’ and close the window. Open the Safari browser on your computer. Click on the small ‘Settings’ icon present on the top right corner of the browser. From the opened menu, click on ‘Preferences’. A new window will open. Click on ‘General’ tab. From the drop-down menu next to the label ‘Default Web Browser’, select ‘Safari’ as the option. Click on the menu button and select the option ‘Settings’. In the settings, you will find the default browser section. Select the button with the label ‘Make Opera my default browser’. Step 1: Right-Click on the Start menu and select ‘Settings’. A window will open up. Step 2: Click on the ‘Apps’ icon. Step 3: In the left pane, click on ‘Default Apps’. Step 4: Go to the ‘Web Browser’ section. Step 5: Click on Microsoft Edge’s icon. A list will open up. Step 6: Select the browser of your choice from the list. You will see the selected browser’s icon instead of Edge’s. Step 7: Close the window. If you want to change the browser again then simply repeat all these steps. So, these were the two methods through which one can easily change their default web browsers in Windows 10. The first one is done on the browser directly while the second one is carried out on the system.